I’ve been meaning to write some blog material for some time and now I have a lovely new website (thanks Nick!) I have no excuse! I’m going to start with explaining, as briefly as I can, why I am so excited about the microbiome (gut bacteria balance) testing I’m doing. As you may have read in the ‘About me’ section, I have had to do a lot of work in this area myself as I didn’t have the best start – C section/pneumonia at 3 months and given heaps of antibiotics during my early years.. I always thought I had a robust digestion – being a foodie I love all kinds of food (healthy mostly thankfully, but not always…). As I never experienced obvious digestive issues whether I had eaten a rich meal or super healthy ones, I didn’t think this was my problem area – despite having a few health challenges. When the results of my microbiome and leaky gut (intestinal permeability) tests came back (some years ago now) I was rather stunned that it wasn’t a healthier result but knowing what I do now about the factors that impact the microbiome, I’m not at all surprised. 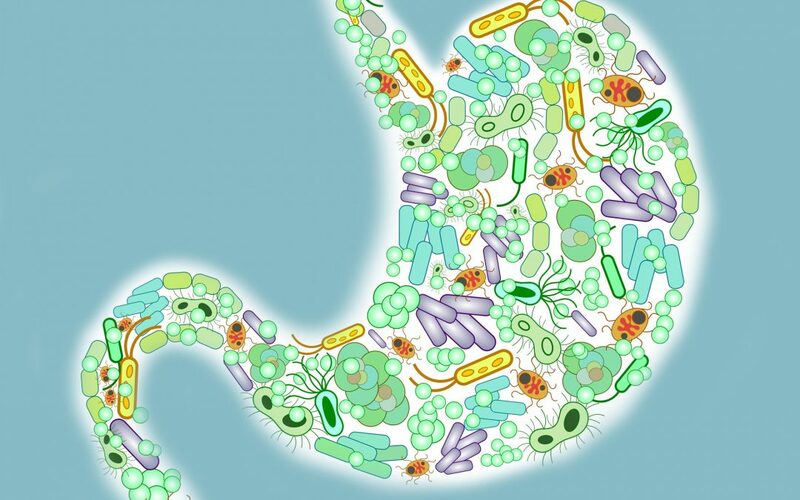 What are microbiome and when should we test them? Your gut is made up of trillions of bacteria, fungi and other microbes which are collectively called the microbiome. The gut microbiome plays an extremely important role in your health by not only helping to control digestion, but also benefiting your immune system and many other aspects of health. Fascinatingly, when our microbiome is out of balance this not only contributes to digestive problems but also weight gain, high blood sugar, high cholesterol, emotional/mental health problems and several other disorders. The good news is that we can support the growth of healthy microbes in our guts by changing the way we eat. The most beneficial foods include fruits, vegetables, whole grains and fermented foods (more on these in another blog). If your digestion is healthy and you don’t have any specific health concerns, you can simply start to increase these foods and your microbiome should respond positively. If people have digestive concerns, these foods can exacerbate their symptoms and so this is when it can be helpful to conduct testing. I am now doing much more testing with clients (having done numerous hours additional training in this area over the last few years) and the results are proving to often be the key to turning around people’s health. It’s a complicated area, but the testing is now much more accurate and sophisticated and the results enable us to gather clear information about the specific areas to focus on for you as an individual. Some of the testing companies I use are able to link certain bacteria to conditions (ranging from auto-immune to Alzheimer’s to mood disorders). Although we have a lot more to learn about the relevance of these bacteria, it’s becoming clear that reducing numbers of some of the potentially problematic bacteria and improving the general microbiome picture is key to restoring good health. As my clients will tell you, I try and encourage people with long standing digestive issues to try and find the resources to undertake stool tests or small intestine bacterial overgrowth (SIBO) breath tests if they possibly can so we can see in black and white what’s going on. This then allows us to create a personalised treatment plan which is likely to be more effective than second guessing what’s happening. I often work with people who don’t have resources for testing and results can be effective too – it might just take a little longer. These tests can also be extended to include stool chemistry biomarkers like inflammation, digestive enzymes and malabsorption. Measuring zonulin (a protein secreted by intestinal cells which regulates the tight junctions) is a really helpful add on test. This is considered a reliable biomarker for intestinal barrier permeability. It’s important that this barrier is working effectively otherwise it can indicate a condition called ‘leaky gut’ which has been linked to various health conditions – from food allergy, irritable bowel syndrome to auto immune disorders. Excitingly, a new piece of independent research carried out at University College Hospital GI Physiology Unit stated that a large proportion (94%) of people with irritable bowel syndrome have stool biomarker results which indicate potential underlying, treatable cause of their symptoms (including pathogenic [disease causing] bacteria, decreased numbers of beneficial bacteria, pancreatic elastase and inflammation). This is very encouraging as many of my clients have been told there is nothing wrong and they are left in the dark about what they can do to improve their situation. I only use highly reputable labs like Genova, Biolab and Invivo so we can be assured that the results are reliable. The best way to asses the microbiome is using DNA analysis – Genova and Invivo are my preferred labs for microbiome testing – prices start at £200 which is an investment, but the information they give can be life changing. Call me to find out more information.